Outdoor reading weather has arrived, so when my Cozy Reader Club box arrived I took it outside and unboxed it on our back deck. 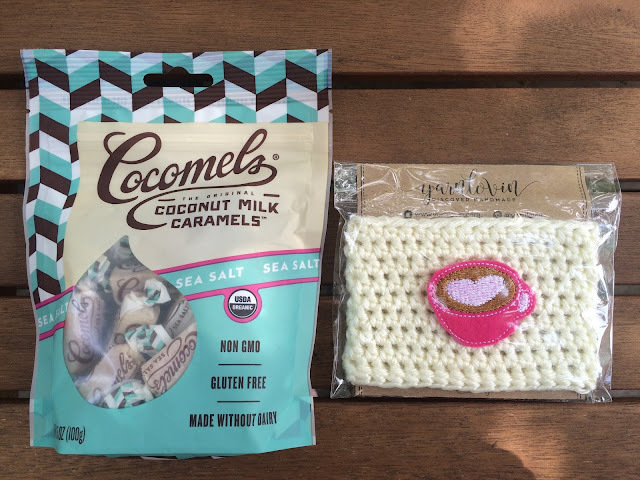 Cozy Reader Club is a monthly subscription box aimed at providing women with everything they need to relax when they are able to steal away a few moments to themselves. Each box will include a newly released hardcover book, a gourmet beverage, handcrafted treats, and handmade items from local vendors. The cost is $64.95/month (+ shipping for international orders). You can used the code READCOZY to get $5 off your first box. Here's what was in the May box. 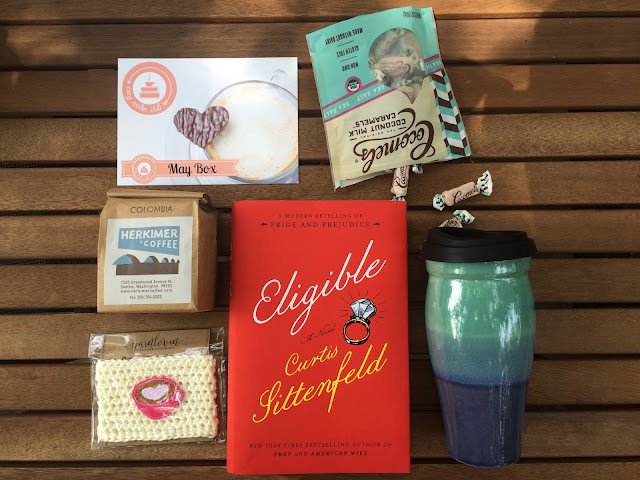 Book - Eligible by Curtis Sittenfeld ($28) - A modern retelling of Pride and Prejudice! "This version of the Bennet family - and Mr. Darcy - is one that you have and haven't met before: Liz is a magazine writer in her late thirties who, like her yoga instructor older sister, Jane, lives in New York City. When their father has a health scare, they return to their childhood home in Cincinnati to help - and discover that the sprawling Tudor they grew up in is crumbling and the family is in disarray." This sounds like such a great summer read. I'm looking forward to reading it. Stoneware Travel Mug from the Etsy Shop Sarah Welch Pottery ($34). This travel mug includes a silicone lid and sleeve and holds 24oz. Herkimer Coffee ($9) 8oz of whole bean coffee. I'm not a coffee drinker, but this is always good to have on hand. Or I know lots of people at work that would enjoy it! Cocomels in Sea Salt ($4.99) Caramel and sea salt? Be still my heart. This combination is my all time favourite, so these caramels won't last long in our house. Plus they are made with coconut milk, so they are dairy free. Mug Cozy from the Etsy shop YarnLovin ($10.95) This is pretty adorable and quite appropriate with a heart mug appliqué on it! I'm pleased with the contents of this month's Cozy Reader Club. I love finding out about new vendors and Etsy stores. Also, the fact that a hardcover book is included adds an extra touch of receiving something special. The value for all of the items included is nearly $87, so that's pretty good for the cost of the box. This is a pricier box compared to other book subscription boxes, so it's not for everyone, but I really think that this box is like two boxes in one. You get a fantastic book, plus a number of other lifestyle items. Visit the Cozy Reader Club website to order one, and remember to use the code READCOZY for $5 off. 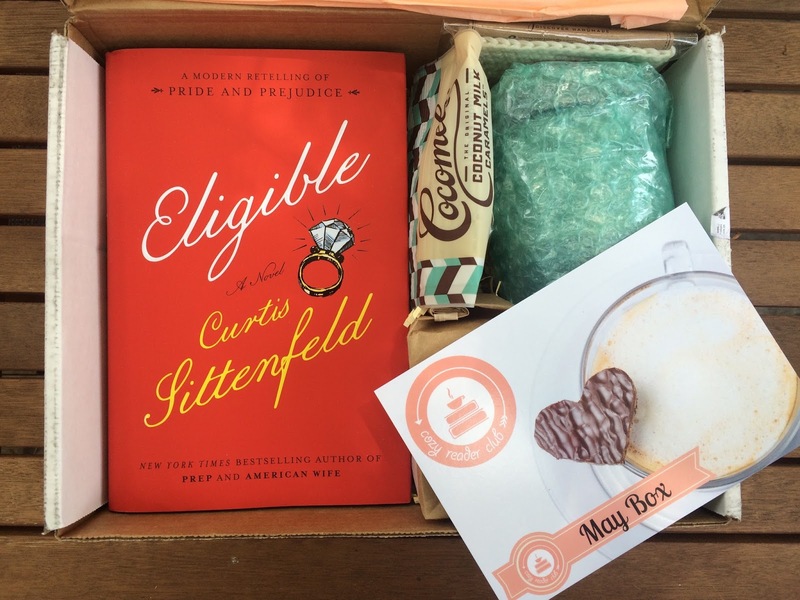 Disclaimer - Cozy Reader Club was kind enough to send me a box for review. All thoughts and opinions are entirely my own.